Hollywood is known to make unusual pairs, for example Cate Blanchett and Brad Pitt in the Curious Case of Benjamin Button or Leonardo DiCaprio with Cate again in The Aviator. But nobody ever expected Meryl Streep to work with Hugh Grant for the film Florence Foster Jenkins, but yes it has happened. Florence Foster Jenkins really did exist and was a rich heiress in the 1930s living in New York. She loved acting and music by Mozart but she was never a really good actress or singer. 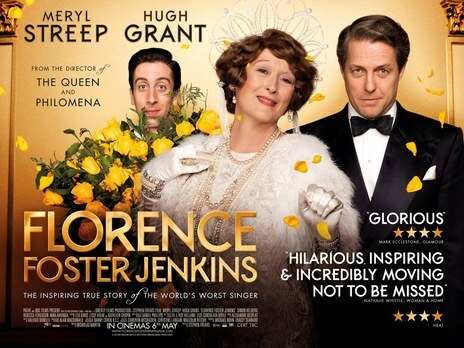 Director Stephen Frears who directed The Queen, which gave Dame Helen Mirren her first Oscar, could not have chosen a perfect actress like Meryl Streep to be Florence Foster Jenkins. The film starts with a theatre scene, where her husband St. Clair Bayfield (Hugh Grant) is narrating a scene about an angel, and Florence comes down dressed gaudily as an angel with wings. Florence gets the idea to do something different and proceeds on a quest to learn how to sing and we meet her pianist Cosmé McMoon (Simon Helberg). He cringes and cannot believe that this terrible voice is so ambitious and that her husband is doing everything possible to make her dreams come true. Florence is suffering from syphilis, which she contracted from her first husband, and St. Clair Bayfield is almost 15 years younger to her but they have an understanding. Watching Meryl Streep be her usual quirky artistic self is amazing. The real show stealer is Hugh Grant. He is the perfect English gentleman and even though he loves Florence and cannot bear her bad publicity, this role should certainly gain him a BAFTA Award. Simon Helberg who is famously known as Howard from the TV series The Big Bang Theory is apt for his meek pianist honest performance. Fame can make or break you and with Florence Foster Jenkins you learn that you are unstoppable until the public let you.